I had the opportunity on Saturday to test ride a Global Ride roller workout DVD – “Climbing Suffrage in Italy“. Here’s how that opportunity came about — my wife was working this weekend, and my parents were out of town so I was in charge of our kids all day. When my wife came home in the evening, it was too late to go ride outside so I thought this was the perfect opportunity to try out this new workout. I rarely ride inside, and when I do I am usually doing a recovery ride on the rollers while listening to music or watching an old Tour de France or Paris Roubaix DVD. But this day was different because I knew that I had a hard race coming up on Sunday, and also because the people I would be racing against were all racing in Dilworth, NC at that very moment. So I wanted to get a good hard workout in to get my legs ready for Sunday. The Global Ride DVD was absolutely PERFECT! Normally I can’t get my heartrate out of Zone 3 on the rollers but with this DVD I made it all the way into Zone 5. The music was great although the first five minutes of introductory warm-up music was a bit too mellow for my taste. I think you were supposed to be stretching during that time, but I just spun easy. Then the last few minutes of easy warm-up was some good upbeat music before hitting the first section of the course — rollers on the scenic 2009 Giro D’Italia Stage 12 TT course. This was still a warm-up section, but at a faster pace as encouraged by the New Zealander coach. 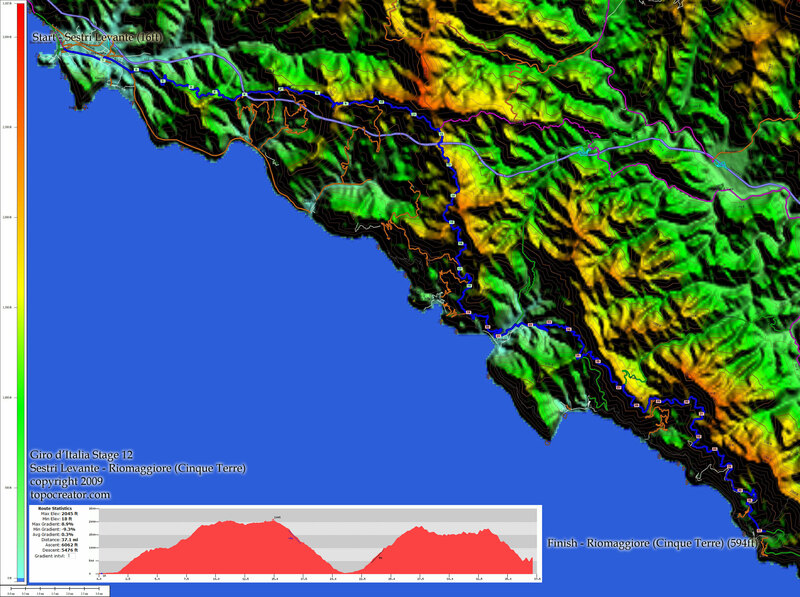 I believe the section that was covered was from miles 9 to 12 (see my topocreator map below). The views were stunning! Then onto the main climb for the day — a 30 minute climb in Italy — the DVD shows you a nice Google Earth animation of the climb right as you hit it. The climb is not simply 30 minutes all out, but rather, the coach and the two accompanying riders do a good job of helping you go faster of slower to recover. The video coverage is smooth and switches between the view of the road ahead (mostly) and then a view of the companion riders who are either behind or ahead of you depending on what effort the coach currently has you doing. There are also occasional views of the spectacular scenery too. Once you push it to the top, you only have a couple minutes rest before you hit a different climb. This climb is full of switchbacks which the coach uses to push you hard on some short intervals. The cooldown begins once you make it to the very top as you see a beautiful ocean view stretched out below you looking back down to the beach where you could imagine you had just climbed up from. Then there are some scenes of Florence as you finish your cool-down. This entry was posted in Training and tagged dvd, rollers, topocreator on May 3, 2010 by kartoone.